Anselmi Mierzejewski Ruth & Sowle P.C. 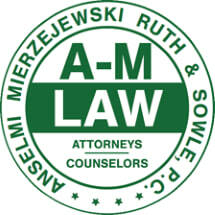 The Anselmi Mierzejewski Ruth & Sowle P.C. specialize in the defense of civil actions, both property and casualty, on behalf of insurance carriers and self-insured businesses. The firm is staffed with ten attorneys: principals Kurt A. Anselmi, Joseph S. Mierzejewski, John D. Ruth and Mark Sowle and associates Casey R. Krause, Marcy E. Mierzejewski, Lawrence J. Pochran, Michael Phillips, Kevin Wirth and Julie Brainer.